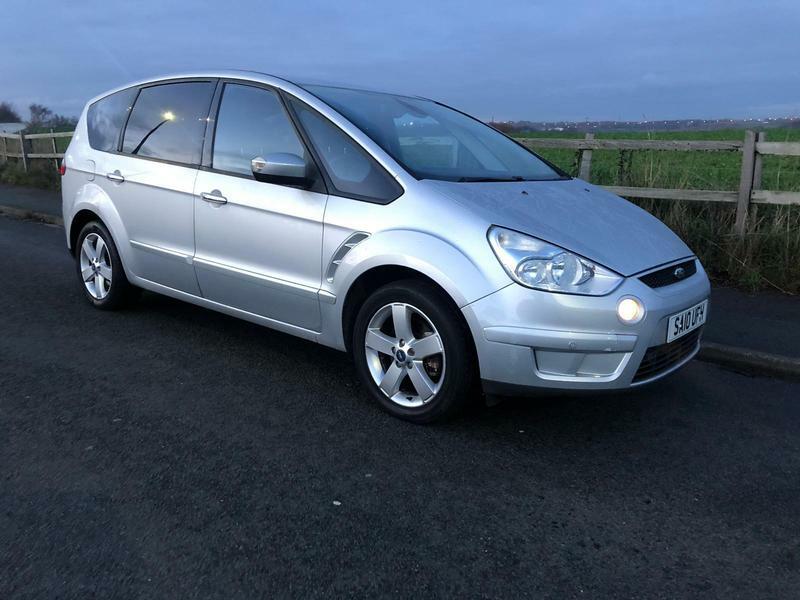 A great example of a Ford S-Max 1.8 TDCi Titanium 7 seats 5 door MPV in silver with a 6 speed manual gearbox. looks and drives superb. It would be ideal for a family. Not to be missed. HPI clear., 12 months MOT, Service history, Excellent bodywork, Grey Cloth interior - Excellent Condition, Tyre condition Good, Air-Conditioning (Automatic), Alarm, Alloy Wheels (17in), Computer, Cruise Control, Electric Windows (Front/Rear), Heated Front Screen, In Car Entertainment (Radio/CD), Paint Metallic, Parking Aid (Front/Rear), Airbags, Anti-Lock Brakes, Armrest, Body Coloured Bumpers, Centre Rear Seat Belt, Child locks & Isofix system, Electric door mirrors, Electric windows, Folding rear seats, Front Fog Lights, Head Restraints, Height adjustable drivers seat, Immobiliser, Mirrors External, Mirrors Internal, Parking aid, Power Socket, Power steering, Remote central locking, Side Protection Mouldings, Steering Wheel Mounted Controls (Audio), Traction control, Upholstery Cloth. 7 seats, Silver, Finance available. AU Warranty included if on screen price paid, terms and conditions apply. All major debit/credit cards accepted. Part Exchange welcome. Test drive welcome. We are open 7 days a week. Please call us on 01924 565650 or 07474228082. Nationwide delivery available, please contact us for further information. You can even email us at rylstonemotors@outlook.com or why not visit our website, www.rylstonemotors.co.uk, 2 owners, £4,495 p/x welcome.